How it works: After you select the game package you are buying and you have registered to make the purchase on https://robertsspaceindustries.com , you will see an field in the form asking if you have a referral code. By entering that code above you get 5000 UEC, which is the in-game currency to use on any store item, which include things like cosmetics. 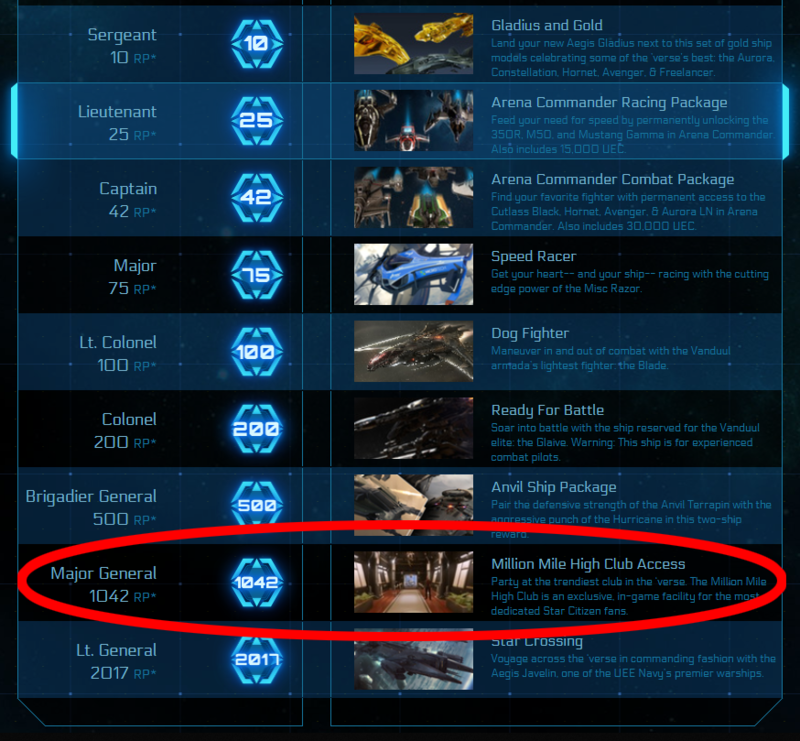 By using this Star Citizen referral code, the org will get rewards at different levels. We don't care about the ships, we have more Javelins than we know what to do with, but what we do want is the Million Mile High Club! Bring the heretics into the fold my fellow TESTies! For we accept the poor (preferably poor due to buying loads of ships) the crippled (we have endeavors to fix them) and the sick (well, there is always biological warfare if the whole endeavor thing doesn't work out) willingly! Be sure to smash that like and subscribe button and don't forget about the bell! Million Mile High Club.........thats a name i havent heard in a while! Suggestions... each time you get a Google Adwords promo for $100 to $200 use it for this. The main ways to get there right now is by paying for it.. either with ads or with a LOT of time in marketing via content that targets people who haven't signed up yet that may want to. Mile high club... I dunno if I could survive a million of them, I have enough problems surviving the one I have now! We have had 2 people in the Jump club get it through google ads if I recall. WE DON'T CARE ABOUT YOUR TAMPAX CLUB, WOLFY! Also, how many TESTIES fit in the MMHC? um, boss, y'know most of us already have game packages, right? This thread was not meant for you! K, long stories with lots of relevant words in proper grammatical usage in context. GO! Or even stories of your experience in TEST squadron on why you stayed and finally concluding your story with use this referral code. If you want to get this thread found it needs to be linked everywhere. I have used Google Adwords in the past for referrals and they are very effective. You have to make sure you use right key words that target people who are creating new accounts. Spending $25 and receiving a $75 credit can net you about 15 -20 Recruits and around 100 Prospects. Using Alt accounts and your own referral code is good way to earn a little money from the grey market too. I woke up from a nap when i heard the word party. Party? Did someone say "party"? Gonna assume you are being serious. Google adwords is an online advertising platform developed by Google, where advertisers pay to display brief ads, service offerings, product listings, video content, and generate mobile application installs within the Google ad network to web users. Create an account using my referral code and receive 5,000 Free in-game credits. You would alter the search words to get the people who clicked your ad to be people who needed a referral code and were trying to setup a Star Citizen account . When someone clicked on my ad in google search, the ad would take you to the referral page with my code in place. You would alter the search words to get the people who clicked your ad were trying to setup a Star Citizen account. When someone clicked on my ad in google search, the ad would take you to the referral page with my code in place.